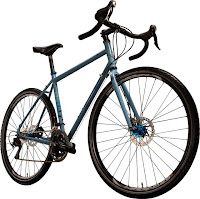 You may have noticed that Lester is riding a 2013 Giant Escape RX 0 bicycle, which we have in stock and on sale for $1,149.99 (originally $1,279.99) as part of our Summer Clearance Sale! 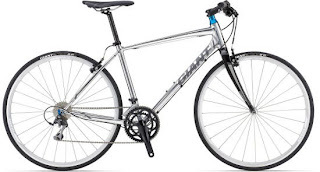 This flat-bar road bike features and upright riding position, with a lightweight aluminum frame, carbon fiber fork, Shimano 105 derailers and crankset, and Giant All-Condition 700x32C tires to tackle any road or bike path. 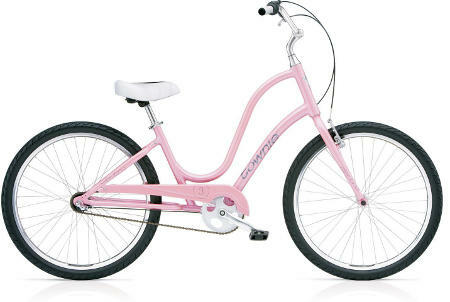 Make your guest appearance at any of the three Century Cycles stores to test one out! 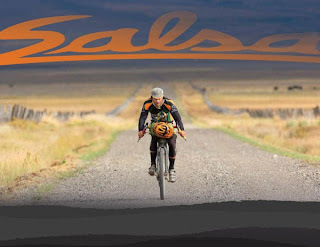 Salsa. Adventure by Bike. 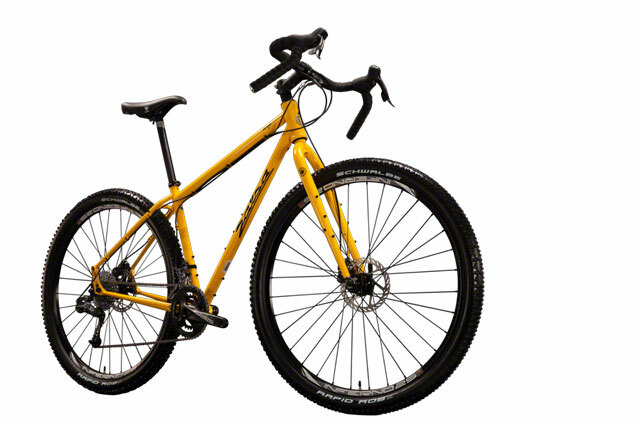 Now available at Century Cycles. Century Cycles is dedicated to keeping the spirit of adventure alive in bicycling. 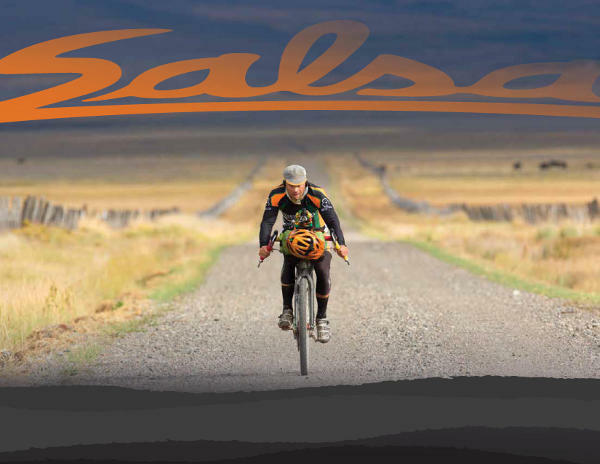 Salsa Cycles makes bikes to help you get there. A sense of adventure makes life better. The bicycle can be so much more than just a bike; it's a path to new places, new people, and amazing experiences. 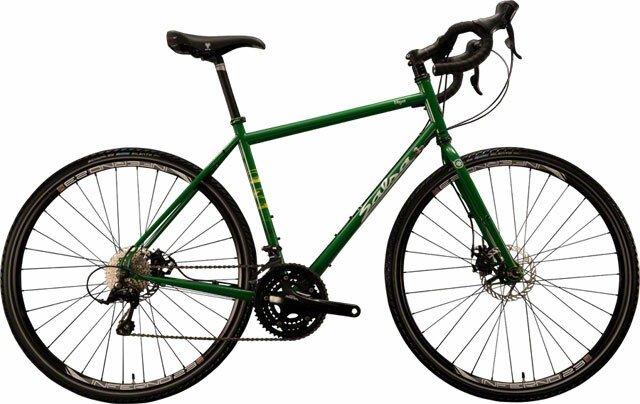 The Vaya is Salsa's touring and road adventure bike, designed to handle any 'road' surface, from pavement to gravel. The CroMoly tubeset is carefully selected to provide an excellent ride quality with a full touring load, yet is a pleasure to ride unloaded as well. Enjoy a long day in the saddle. Do a light tour. Or load your panniers to the hilt for a month of two-wheeled discovery. 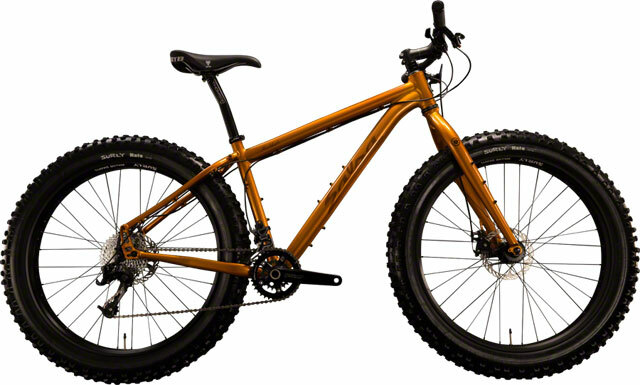 The Fargo is Salsa's drop-bar, off-road adventure bike. Drop bars provide multiple hand positions for long rides on singletrack, gravel, and pavement…or possibly, a mix of all three. Fargo 2 - coming soon! Fargo 3 - now in stock! Salsa Mukluk - coming soon! 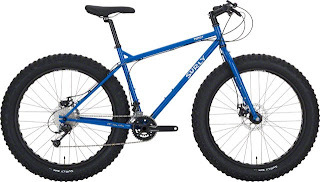 The Mukluk is Salsa's ride-anywhere fatbike. 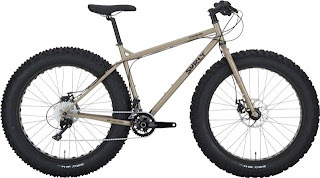 It provides extreme tire floatation and traction and rides where other bikes can’t whether on game trails, sandy beaches, backwoods mud runs, snowy singletack, or frozen lakes and rivers. Aluminum tubing is lightweight and extremely corrosion resistant. Melting snow, adventures beneath the high tide line, or an accidental dunking in the beaver pond won’t cause the frame to rust. Ride where other bikes can’t, whether overgrown, sandy, muddy, slushy, frozen or downright dreadful. Just a reminder that our Summer Clearance Sale is going on NOW through Labor Day! 20% off all Giro Shoes for Men and Women, and 20% off selected models of shoes from Pearl Izumi and Shimano, including the Shimano SH-R170 road cycling shoes. "Our sample size 45s weighed 295g per shoe. While not as light as, say, the 250g Specialized S-Works Road shoe, the R170 is half the price." "The firm upper material doesn't have any give, so it doesn't stretch over the course of the ride the way some hyperlight shoes can." "The best road shoes we've ridden at this price." Originally $199.99, now $159.99 and in stock in all three Century Cycles stores in size 40 through 48 (size selection varies by store). 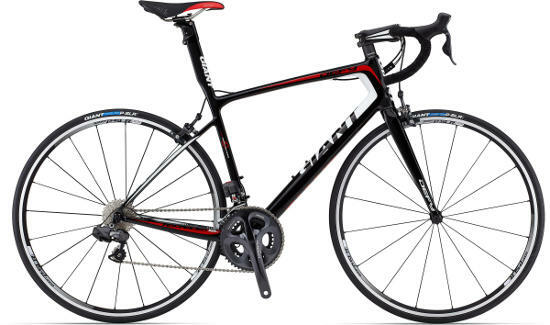 Looking to upgrade your road bike to a top-of-the-line carbon fiber frame and fork, and Shimano's electronic drive train? There's no better time than now, with the 2013 Giant Defy Advanced SL 1, originally $5,799.99, now $4,999.99! With the Ohio's state sales tax going up 0.25% beginning Sunday, September 1, you'll save even more if you buy by this Saturday! 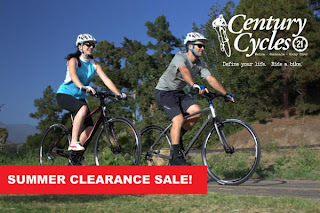 Check out all of our clearance bicycles. 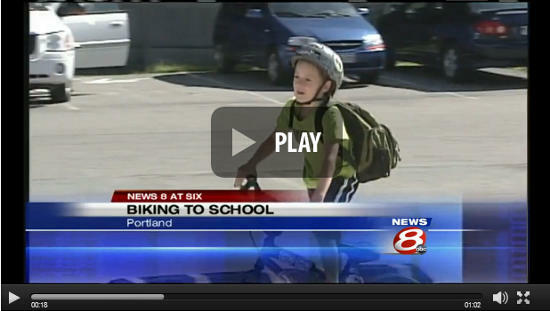 Looking for bike commuting accessories for yourself, or for the kids heading back to school? 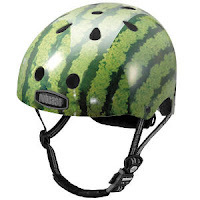 Every colorful and stylish helmet from Nutcase is 20% off, including the Watermelon Head, their best-seller nationwide! 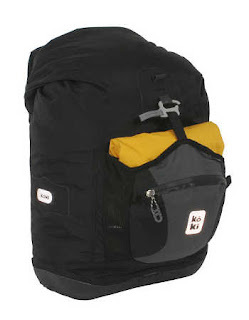 And every rack-mounted pannier bag from Koki is also 20% off! See www.centurycycles.com/for/SummerSale for more clearance sale details! 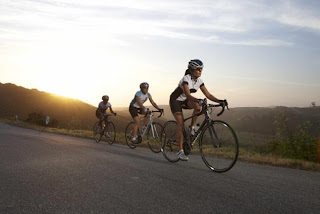 Join us for our LAST Sunday Services Group Road Bike Ride of the season in Peninsula! The ride starts at 8:30am on Sunday, September 1 from the parking lot of our store. Please note the EARLIER start time, because of our new expanded Sunday hours. 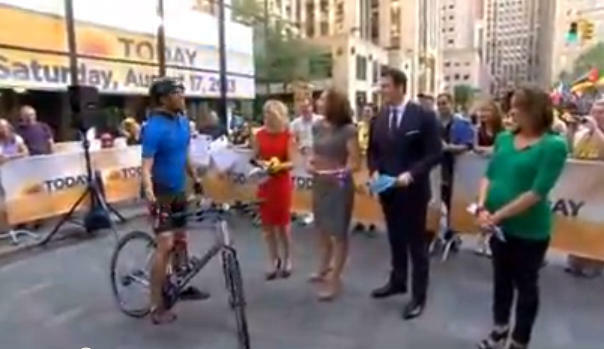 We'll start riding at 8:30am SHARP! Extra cue sheets will be left behind for anyone that arrives late. 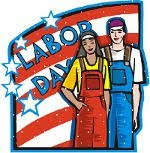 PLEASE NOTE: All three Century Cycles stores will be CLOSED on Monday, September 2, 2013 in observance of the Labor Day holiday. Sorry for any inconvenience! 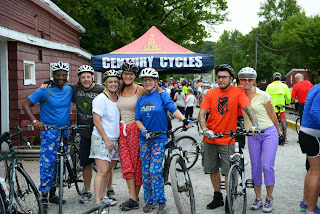 Beautiful, mild summer weather brought out over 250 riders for our 4th Annual Pajama Party Night Ride on the Towpath Trail on August 10, 2013. Thank you to everyone who helped make it another special evening, and along with Grunt Girl Racing, we thank everyone who brought donations for Project Night Night. Thanks to Petch (from the Medina store) and Doug and Joe (from the Peninsula store) for the awesome photos (see below)! We will be upgrading our bicycle rental fleet in Peninsula at the end of the 2013 season. We will be making our current rental models available for sale on a first-come, first served basis. Used rental bikes are sold AS-IS; all sales are final. Used rental bikes are NOT eligible for our usual new bike benefits (10% discount on parts & accessories, 90-Day Free Tune-Up, free t-shirt). 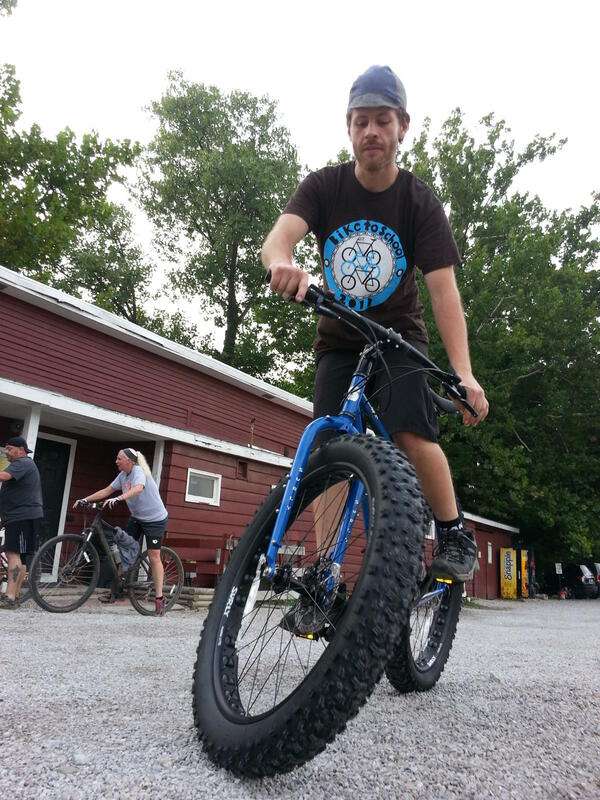 We will continue to rent the bikes for the remainder of the 2013 season; the exact timing will be dependent on the weather. We will call each customer when their bikes are ready to be picked up, most likely around the beginning of November. Availability of the used rental bikes is on a first-come, first served basis beginning on September 7. Buyers must be present to select their desired model and size; no phone sales. If you wish to arrive before 8:00am, the line will form at the double red doors near the back of the building. 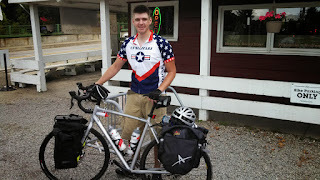 Mike Wheeler lives in nearby Akron, and was out on a training ride to yesterday and stopped by the Century Cycles store in Peninsuala. On September 10, he'll be riding from his home to Pittsburgh, where he'll then hop on the Great Allegheny Passage and C&O Canal Towpath Trail to Washington, DC. He's anticipating the trip will take about 10 days. Tim Donovan of the Ohio Canal Corridor brings you this latest video update on the construction of the Ohio & Erie Canal Towpath Trail in the Scranton Flats area just outside of downtown Cleveland. He is joined by Jocelynn Clemings, Public Information Officer for the Ohio Department of Transportation, who shows us how the Innerbelt Bridge Project is helping with the Towpath construction in the adjacent area. 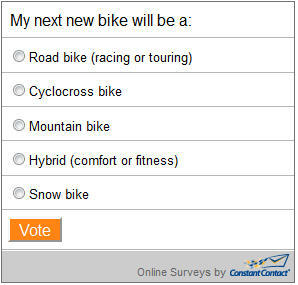 Poll: What will be your next new bike? How many bikes does a person need? The running joke among bike aficionados is that every person needs "N+1" bikes, where N is the number of bikes that you currently have! 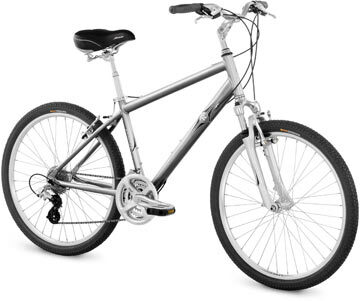 Whether you've got one bike or N bikes, what kind of bike will your next one be? Click here to take our latest online poll and let us know! 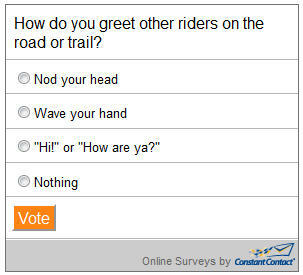 Last month's poll asked "How do you greet other riders on the road or trail?" The top answer, with 41% of the vote, was a simple "Nod of the head." 3% of the of the bike snobs responding answered "Nothing." You can see the full results of the last poll here. Choosing the car rack that's right for your needs is a process of finding a balance among cost, convenience, and security. Of course, the staff at all three of our stores has plenty of experience with installing car racks of all types. We can help you select the right rack to meet your needs and budget, and ensure that it is installed according to the manufacturer's specifications for the utmost in safety and security. This may sound a bit ridiculous at first--if you're preparing to invest many thousands of dollars in the car of your dreams, why should your choice be affected by a $100-$200 bike accessory? 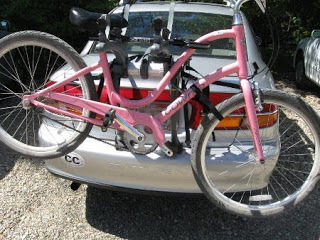 However, if you're serious about cycling, then you're probably serious about carrying your bike(s) around safely and conveniently. Once you've settled on both the car and the rack you want, check with us or use the rack manufacturer's fit guide to verify that the rack is compatible with the vehicle. If you've already got a car rack, and are considering replacing your vehicle, verify the fit of your rack on the new vehicle that you're looking at. For short trips down to your local bike trail, it's okay to leave your wheels spinning, but for long drives, you'll want to have some way to keep them in place. 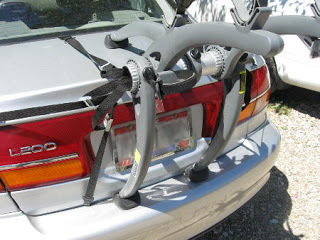 If you're using a trunk rack, then you can tie the loose ends of the support straps around each wheel. Most hitch racks come with a spare strap that you can use for this purpose. 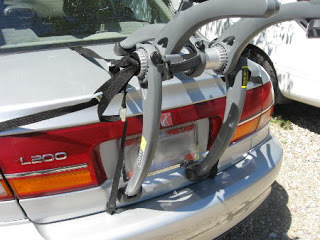 This won't be an issue for most roof racks (and some types of hitch racks), since the wheels are held in place by the rack itself. Keeping the wheels from spinning while you're driving down the highway saves wear and tear on your hubs' bearings. If the wheels are spinning, it's almost as if you're riding your bike the whole distance that you're driving! At least once a year, we have somebody bring in a bike for evaluation after it's been crashed into a garage while on a roof rack. 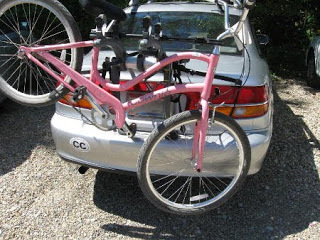 Avoid this situation by coming up with a system for reminding yourself when you have your bikes loaded. One common scheme is to put your garage door opener inside one of your cycling gloves. 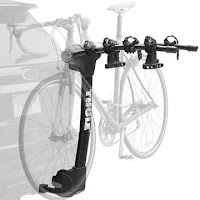 Another method is to place your garage door opener in a different location inside your car whenever you're carrying bikes. Of course, you've still got to worry about public parking garages and drive-thru service lanes with low clearance. Some people have a sign that they tape or suction-cup to the winshield that says "Bikes On Roof." Whatever it takes to avoid a catastrophe that can mean costly repairs to your car, your bike, and your home. The Northeast Ohio Areawide Coordinating Agency (NOACA) is once again conducting bike counts to assess bicycle usage in various areas. 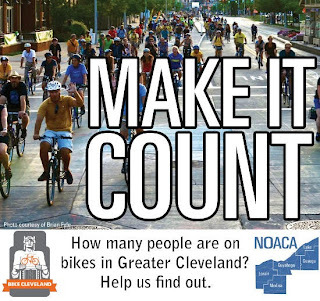 Along with Bike Cleveland, we ask you to consider volunteering your time to help count people on bikes September 10th-14th. The data you help collect will be used to improve biking conditions in our community. In addition to knowing that you are helping make riding a bike an enjoyable experience for people of all abilities, volunteers will receive a gift card to a local bike shop of their choice...WHAT?!? That's right, a free gift card to get some sweet bike gear just for helping count bikes, SO SIGN UP NOW. If this is your first time participating in in a bike count with NOACA, you will need to attend a short orientation session. For more information and to sign-up go to www.noaca.org/BikePedCounts.html or contact Marc Von Allmen at mvonallmen@mpo.noaca.org or 216-241-2414 ext. 250. Dozens of bicycles on sale! 20% off all Cycling Jerseys for Men and Women! 20% off all Giro Shoes for Men and Women! 20% off all Nutcase Helmets! 20% off all Koki Panniers! 30% off all shorts, jerseys, and accessories from Hincape Sportswear! Through Labor Day while supplies last. No special-orders. Sale purchases are final. Cross-Country bicyclists visit TWO Century Cycles stores! Pictured left to right: Brendan Regan, Nathalie Hopakun, and Robert Penza. They left Boston, Massachusetts early this month, and are on their way to San Francisco, California. 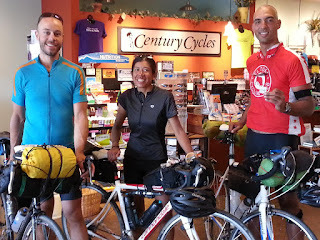 They stopped in the Century Cycles store in Peninsula on Wednesday to ask about the best route west. 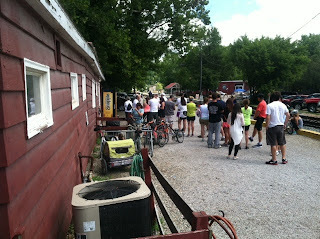 We directed them to our Medina store, where our staff there helped them reach the nearest campground. 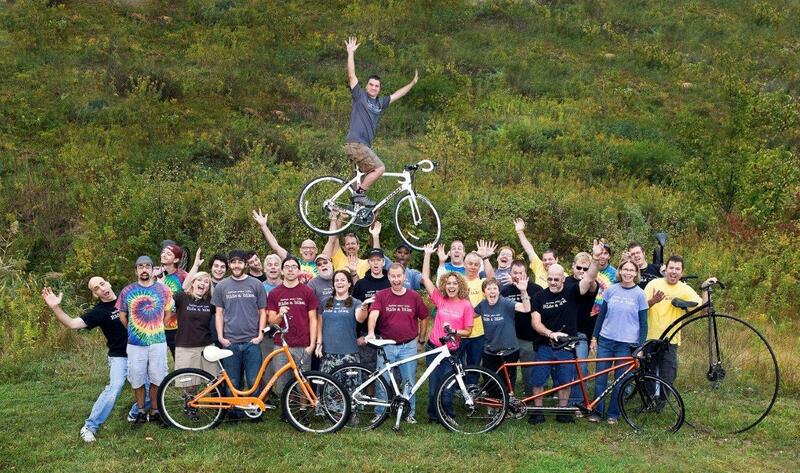 Want to work for the area's best bike store? Century Cycles is always on the lookout for talented individuals to help in providing outstanding service to our customers! You must love cycling, of course, but you must have the ability to smile, learn, be hard-working, enthusiastic, and love talking to people. Previous bike shop or other retail experience is a plus, but we will consider training the right person for sales. Century Cycles offers competitive wages for our industry, plus benefits. We are in need of a Sales Associate, Mechanic, and Rental Bike Associate in our Peninsula store for the remainder of the summer/fall season. Those who excel in the positions will be asked to return in the Spring of 2014. Sales associates and mechanics in our Rocky River store. To apply, you can fill out our online Application for Employment. Century Cycles also has a part-time position open in MARKETING. The ideal candidate will be experienced at marketing, public relations, social media, and graphics and design. Knowledge of Century Cycles, our position in the Cleveland/Akron market, and cycling in general will be a big plus. If interested in the Marketing position, please contact general manager Mike Petcher (petch@centurycycles.com) or owner Scott Cowan (scott@centurycycles.com) and attach your resume. For regular hiring updates, visit www.centurycycles.com/to/joinourteam. Beginning this Sunday, August 18, Century Cycles is expanding our Hours of Operation in the Peninsula store. Until further notice, we'll open at 10:00am and close at 6:00pm each Sunday With this expanded schedule, we hope to better serve our Bicycle Rental customers, especially those using the Bike Aboard! 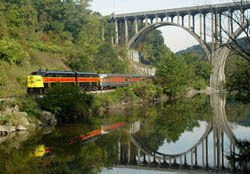 service on the Cuyahoga Valley Scenic Railroad. 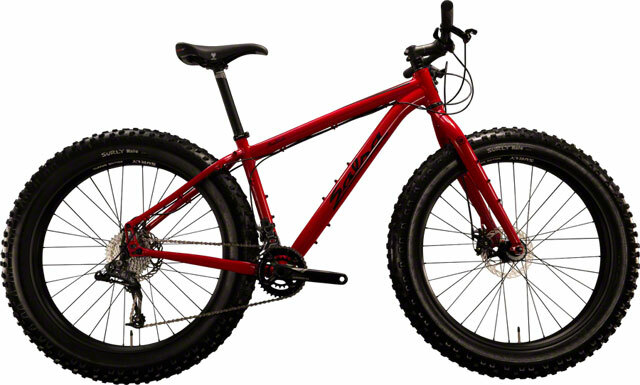 Snow Bikes Back in Stock! It may only be August, but here in Northeast Ohio, it's never too soon to start making plans for the winter. That's why, for your riding pleasure, we've got the new crop of 2014 snow bikes/fat bikes from Surly IN STOCK NOW! 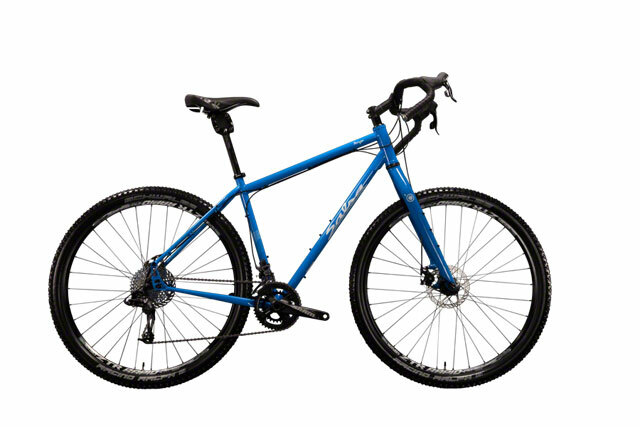 The new Surly Pugsley features a sweet new Blue color (True Blew, in Surly-speak). We've got a size Medium in stock at the Century Cycles shop in Peninsula, and a size Small in Rocky River. 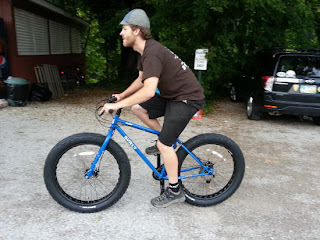 Ace bike-builder and mechanic Ryan B wasted no time in getting out on the new Pugsley to see how it handles. If 4-inch wide tires aren't enough for you, then the Surly Moonlander with 5-inch wide tires is back and fatter than ever! Now available in the color of Metallic Sand, we've got one in Large in our Medina store. Availability is subject to change; please call us to verify before stopping by! Hurry, while it's still warm enough to ride in short pants! If you're not planning to join us for the Pajama Party Night Ride on the Towpath Trail this Saturday, there's another reason to stop on down to Peninsula for family entertainment. 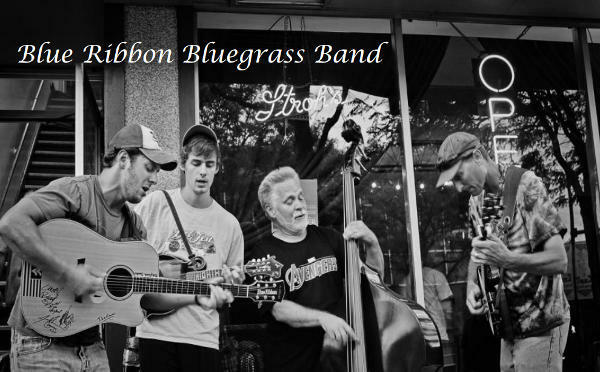 The Voices in the Valley concert series features the Blue Ribbon Bluegrass Band at the G.A.R. 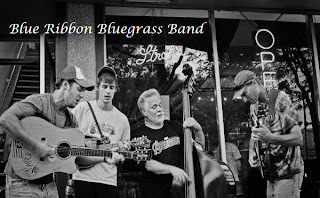 Hall (1785 Main Street) on August 10 at 7:00pm. Admission is $5 at the door, but if you ride your bicycle to the event, you can take $2 off! See the full schedule of events and more details at www.peninsulahistory.org/voices-in-the-valley/. 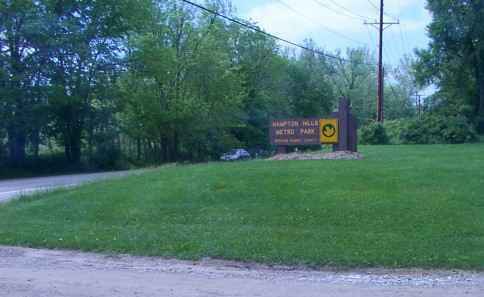 Metro Parks, Serving Summit County is seeking three volunteers to participate on an advisory committee for the mountain bike trails planned for the Hardy Road Area in Hampton Hills Metro Park. Committee members may assist in flagging trail sections under construction, test riding and rating completed sections, and/or making suggestions for improvement. Phase I of the project includes three miles of mountain bike trails and a new parking lot off Akron-Peninsula Road, south of Bath Road in Akron. 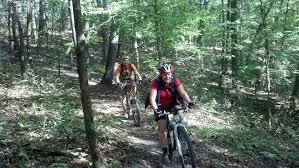 The park might include more than seven miles of mountain bike trail in the next few years. Volunteers must have a current driver's license and enroll in the park district's volunteer program, which includes successfully completing a criminal background check. The three volunteers who are chosen will have to work together as a team in support of the park district's efforts. 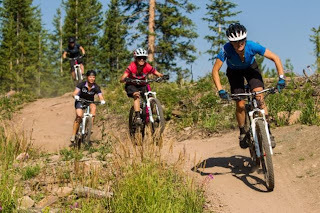 Individuals will be selected based on their knowledge of single-track trail construction, mountain biking experience, and their ability to work with Metro Parks staff during scheduled visits. Applications may submit a letter of interest to Mark Avery, Project Manager, via email to mavery@summitmetroparks.org or via postal mail to Mountain Bike Trail Committee, 975 Treaty Line Rd, Akron, OH 44313. 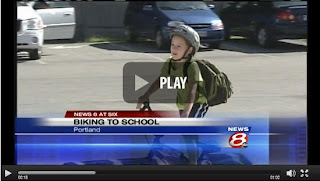 In the Inspiration of the Day department, check out this story from Portland, Maine about Alex Kimble, who decided to ride his bicycle to school every day of his kindergarten year. His whole class was out to cheer him on when he arrived on the last day of classes in June. Along with his father, Nate Kimble, he pedaled the few blocks from their home to school every day through sun, rain, snow, and every other kind of weather in the blustery Northeast. Click here to read the whole story and watch the video from local TV station WMTW in Portland, Maine. Liv/giant and Century Cycles bring you a FREE Women's-Only Basic Bike Maintenance Clinic, presented by Jen Audia, Trainer and Event Coordinator for Liv/giant. Refreshments will be served! Attendees will receive a 15% discount on bike accessories and clothing the night of the event. Please call the store at 330-722-7119 to RSVP. Or, you can respond and ask questions at the event on Facebook. Poll: How do you greet other riders? One of the classic cycling dilemmas is the road cyclist, decked out in a racing kit, who never acknowledges other riders, versus the friendly commuter or mountain biker that's always eager to show their support for somebody else on a bike. It's so much like the "snobs versus the slobs" that you could almost make a movie out of it! But there are exceptions, of course. How do you greet other riders on the road or trail? Click here to take our latest online poll and let us know! Last month's poll asked "What's your favorite recovery drink after a long ride?" The top answer, with 32% of the vote, was "Beer/wine/martini/cocktail." A close second were "Energy drink or smoothie" (25%) and "Other" (23%). You can see the full results of the last poll here. The mild and mostly dry weather we've been enjoying lately provides perfect conditions for bicycle touring. This gentleman, "Krazy" Larry Nelson from Chattanooga, Tennessee, stopped by the Century Cycles store in Peninsula yesterday. He had spent the night in the camping area of the Stanford House. 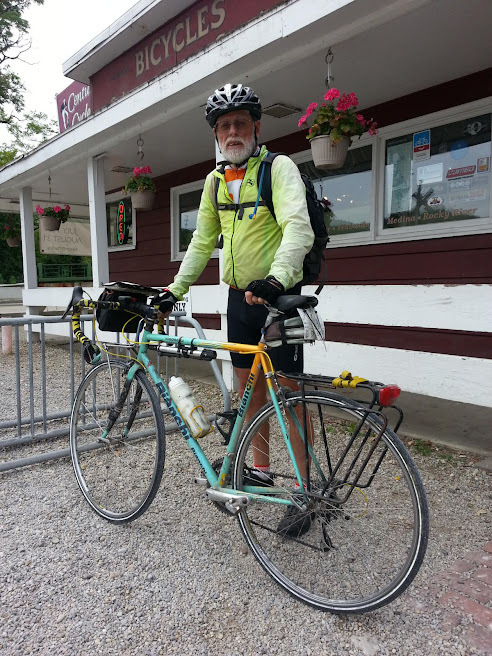 After winning a bronze medal in the triathlon event at the recent Senior Games in Cleveland, he's heading out on a cross-country bike tour using the Underground Railroad Bicycle Route and the Northern Tier Route.